there is life out there! Going big today: from my tiny laptop corner – whatever it could mean in my quite small house (being posh I’ll call it cosy) – I moved to the big PC in my son’s room. Pros: it is huge, has a widescreen on the wall, when typing the key buttons get flashed with a fainting purple light, if used in the right way the entire hub will cook dinner and wash the dishes, I am pretty sure of this! Cons: the screen is too far away for my lenses: I look like a mole trying to read the writing – literally – on the wall. I already feel a little dizzy … but I am cool! Gosh I am, with the purple disco light running under my fingertips. Since today we are the 19th, I was bound to cast on for the blackerpodkal on Ravelry and I did. Using Cornish Tin yarn from the stash I am knitting and writing a pattern for a pair of gloves. I had other plans, a cardi, but I came to my senses in time and decided to play safe. Gloves could be useful in March…. At this point of my blogging I am just staring at this wide-screen and the dogs, all the three of them, are staring at me and at my performance (moving my neck like a crane, that is). They are good enough not to comment, just watching the purple light coming out from the black board on the desktop. Mah! Before I go mad, just a hint for one of your emergency suppers/dinners, those with tins involved – tin is the topic today, right? You start with plain boiled potatoes, organic whenever possible, slightly cooled and smashed with your fist. This is very important, it helps you release stress. You bet it was one of my favourite cooking technique apart from squeezing raw cabbage or coleslaw with my bare hands. You season the mess with turmeric, mustard, black pepper, flacks of sea salt (any will be good) and a good splash of olive oil. Adding some rosemary will do, garlic is optional and it will not do if you plan to go to the theatre after dinner. Put the roasting tin (again) in a really hot oven and let it roast for 20 min to half an hour, turning the potatoes at least once. Then it comes the tough part: serve Simmenthal meat (from the tin) in a way no one can spot it at first glance. To my excuse I can tell that I had those tins left from the last time our son was at home alone…. but, anyway, it is not bad at all. You put the meat on the serving plate and top it with the salsa you’ve prepared blitzing together two TBS of mayonnaise (not as professional as Regular Ordinary Swedish Meal Time , but quasi), capers to taste, 3 or 4 cornichons and another splash of olive oil. NB. Olive oil goes always in splashes, not spoons. In any case, do not use the same ratio that Nigella uses when adding wine to her dishes, half a bottle at the time, as I’ve noticed watching her on TV. Too much, you’ll be broken in no time, just a splash. And here you are, your hidden meal is ready. Best served to people really involved in a soccer match on the tv. No one will ask, just have enough potatoes if they ask for more. This is my book of yarns, wide open. It is time for me to buy another copybook, since there is no place left for my labels and yarn samples. Of course there is the stash section at Ravelry, but I am far to lazy to enter the data and all. Nor am I a very organized person. But in the mess you can see above, well…. there is a story. My knitting story. Some of those yarns are gone forever, the production closed, some were given to me by people I love, some were my big buying mistakes, some are my favorite. A whole copybook with more than 10 years of yarn purchases from around the world. Bit nostalgic, I can see it by myself. Boring, even. But the weather …. with “bora” today howling at 150 km/h really does not help. What you can do in stormy weather is making plans, for spring knitting if not for the #blackerpodcal. By the way, I love Louise Scollay and her groovy way to attract her listeners even when she is slapping them on the hands with an invisible stick. Because they deserve it. They try to do dirty businesses with honest knitters, they even dislike Louisa’s vocabulary. What the hell! She is right, would she use the word s*** when needed, who are you to dispute? I really love her and I hope she will not mind if I’l try to embrace her in Edinburgh in March. I count on the fact that she will be busy with her podcast and will not slap me away. Or worse. Sure enough I will not waste my time chasing Jared/the/cable/gloves when munching a sandwich or asking Justina questions (under 60 sec) in Polish. A colleague and friend Malgorzata gave me some useful hints, years ago… so maybe I am not telling jokes. But EYF is still far away. And in case any one of you know Louise in person, please tell her I am Sue Perkins and Mel Giedroyc in one. That is it. I firmly believe that a good lough is a highly consumable Galenic substitute. It does wonders when you are dealing with craps. This story is about the saddest fate of more than 4 kg of organic Sicilian lemons frozen to death in my garden during the big chill that hit us this week. In Trieste we have this lovely wind called Bora, silent most of the year, but when it blows it blows! 100, even 120 km/h in the elegant way of a “refolo”. No need for redbull cans here, I guarantee, you can fly without a drink if you are not trained… So the Bora came and with her (wind is a she chez nous) came some snow, lot of ice and temperatures below zero C. No need to tell you that the precious content of my part of this month’s collective buy of organic Sicilian citruses, oranges and lemons, became solid icy rock. What to do next? Oranges, once thawed, were squeezed, but lemons …. I decided to take them all in, let them stay in my sink for a while, then I washed them and peeled just the yellow part. I let it dry out and now I have at least some organic zest for my cakes. The rest was cored, cut in small bites and covered with sugar then cooked for enough time to become a quasi jelly. Now it is in use as a syrup, lovely to mix with water and drink during the day. Just for the taste of it, it does not make you slim, or bright, or smart. But I could not let my lemons go. Plain and simple. As some people say, we are what we eat. Truth. But we are what we are, so we cook in a hurry, cook from scrap, try to make kids (and adults) eat healthy food, and more times than we are ready to admit, we cook with an eye on what the feast will cost us. Be honest, we all do that! In my entire life I’ve met just one person who was sincerely fond of his big money cooking style. And guess what? He is not around any more to tell the lesson. Was it because of the truffles in and out his pasta dishes or the booze, I don’t know. All I can tell is that not a single one of his recipes has a place in my cooking copybook, even if they were tasty and cherished among common friends. Sad stories apart, here is one of my easy-peasy-when-you-are-busy dishes…. Pesto and mozzarella frittata. 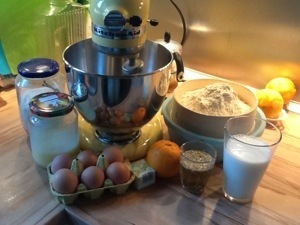 In a bowl you mix the eggs (how many is up to you ), a TBS od flour, a splash of milk and a pinch of salt. Mix quickly and add some pesto. Leftovers from previous day pasta dish will be great. In fact the frittata is a day after special, as an entire pesto jar is too much for one single use. With a splash of olive oil heating in your pan, you are ready. 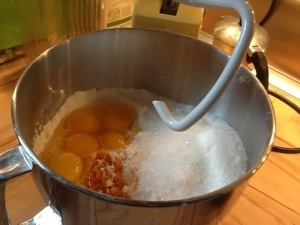 Put the egg mix into the pan and let it stay for a couple of minutes, then gently turn and stir it with a wooden spoon. 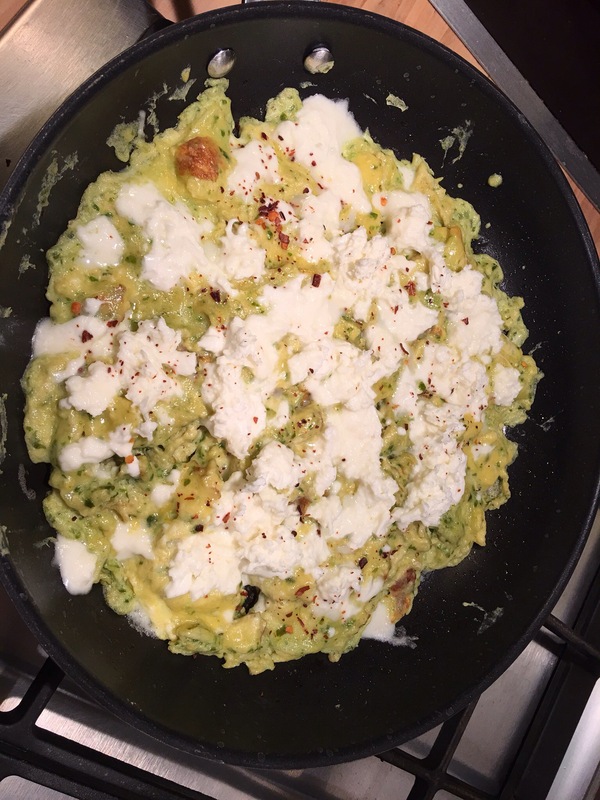 At this step you rip the mozzarella in tiny bits and cover with it the almost ready frittata – a greenish scrambled mix at this point. Cook to taste. Add a pinch of paprika or peperoncino flakes and enjoy with a season salad. And so it happened. Decisions were made, the first and more important being me quitting my job. Not a proper heroic act, they actually gave me money to leave, but not an easy one either. I was an adieu to my first and for more than 25 years only love: journalism. no more shifts, no more reporting, no more stand ups, no more european conferences, no more desk job. Must add no more stress, of course, not related to the job per se, may be, but still. To make a very long story short – because no one could really bother about my office related fights, the stupidity of some new weave but well schooled reporters, the lack of fact checking, the stories people read and belive to – I said goodbye and closed the heavy glass door of my office behind me. No regrets whatsoever. I am a little bit unemployed right now, but I have plans. The worse scenario being me acting as a Hausfrau for the next 10 years (then I’ll officially become a retired journalist), but I will do my best to avoid this option. I am creative. Alas not with dusters and mops. So here we are. At the blog stage. You can find me at the Neolithic stage of it. First because my laptop was found by the volunteers digging the remains at Brodgar up on the Orkney. This could be the only reasonable answer to my question: why are you so slow? This is also the reason why this first post will be so basic. I have so much to learn…. how to make those flashing advertising pop ups drop dead, for instance… but I have time. For the first time since I was 17, I really have plenty of time. No knitting, reading or cooking talk for this first post. I am not even sure there will be a place for you to comment. Not because I don’t want you to, just because I have to find how to operate. Any support will be welcome, any grammar/lexical correction as well. English is not my mother tongue, I am not J.K.Rowling/R.Galbraith, so help me, please. You can either knead as a slave or use a friendly kitchen robot (I am madly in love with my KitchenAid, but any device that will make the hard kneading work will be welcome). Whatever. But remember: you’ll need time and a warm place to let the dough rest. If you are in a hurry, bake a cheesecake instead. Mix the fresh yeats with the milk and some flour. Wait till the yeats will do his job. Sieve the flour and put all the ingredients (be careful to have the eggs, flour and the melted butter at room temperature) in the kneading bowl. 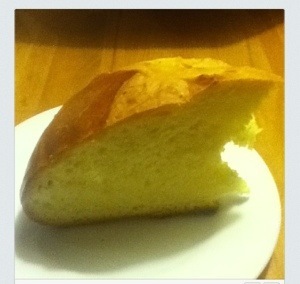 Ok. Now you have to knead and knead and knead, untill the dough does no stick anymore. Refrain from adding more flour. You ( or the robot ) have to work hard! 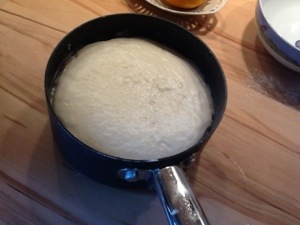 After this, let the dough stay covered for an hour or so. Knead again and repeat. If you repeat this at least once more, you’ll have a superb pinca. Garantee. From this batch you can bake 4 smaller pincas or 2 medium or, of course, one really large. The decision is on you. Just form a ball and put it on a greased baketray. Glaze with the beaten egg and cut a cross in the middle of the ball. You can do it with the scissors or with a knife. Bake in a preheated owen at 200 C for 20 minutes and then other half an hour or more at 180 or even 150 C. The pinca has to be soft, nicely brown where coated with the beaten egg. 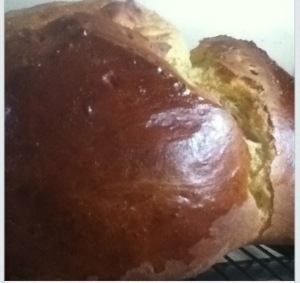 It smells so fine that you have to be very zen not to cut into the still warm bake. But you have to. The pinca is a pinca when all the steam has evaporated.